Minister of the Sea, Ana Paula Vitorino, has demanded that detailed plans for the redevelopment of Faro docks be ready by the end of March. 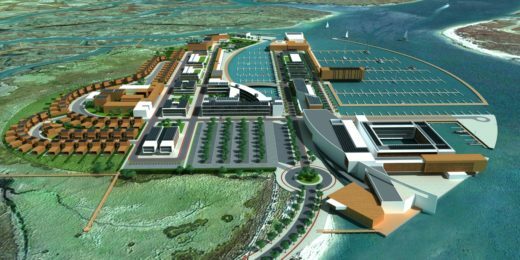 The Farformosa project plans must be agreed and drawn up by a new committee for the development of the Commercial Port of Faro and the Commercial Wharf. A January 2nd entry in Diário da República states that a working group will be set up, comprising three representatives from Faro council, one representative from the Port Authority, one from Docapesca and one from the Portuguese Institute of the Sea, all to be coordinated by someone from the ministry. The group will have to define what activities related to scientific research, maritime businesses, leisure, nautical and maritime sports and tourism should be created in the largely unused Porto Comercial de Faro and Cais Comercial. This working group, usually these are death to any spark of enthusiasm, will have to present a timetable for the implementation of the objectives and carry out the economic-financial and strategic environmental assessments of the plan. The redevelopment of Faro’s old waterfront facilities is an opportunity for sensitive, effective and inspiring planning. Leaving an economic-financial and strategic environmental assessment in the hands of an ad hoc committee of State employees without the necessary skills and who will need to bring in a range of specialists to develop anything other than fantasy, may not be the best strategy from a minister whose promotion of oil and underwater mining, both of which need land based support services, needs continually to be monitored. The Farformosa project was conceived by CCMAR of the University of Algarve and by Faro council and aims to create a enterprise that combines the construction of a marina, an aquarium and 'several hotels', along with assisted residences for the elderly, although no one yet has explained why. The development of this area of Faro could be an internationally important project: to leave its planning to a committee lacking many of the requisite skills could be a ploy by the minister to impose her will, or simply poor management. They must begin somewhere, Ed. Yes, this kind of analysis should have taken place some time ago, and we cannot criticise the Minister for at last starting the project. There seems to be a range of personnel on this committee. Whom would you nominate in their place? Without making the committee so large that it would be impossible for it to function? Remove two of the three council committee places. Add, people from real life not just a line up of pen-pushers that the minister can dominate. A commercial development expert and certainly someone from the tourism sector, someone from Zero to defend the environment and someone with international commercial design experience. This is a huge and important project for the region's capital and could bring many benefits. The council and Port Authority can not be entrusted with such a task. The IPMA comes directly under the Minister. This is a committee that will do the will of minister Vitorino who already has proved duplicitous when the sniff of money is in the air. It would be advantageous to have someone who has a background in Portuguese maritime history on the committee. They could invite some University graduates.